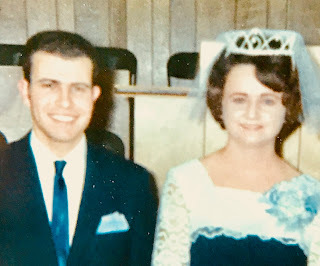 Today would have been my parent's 50th wedding anniversary. Some months ago, I wrote in my journal that I hoped we could keep my mom healthy enough to make it through the holidays--to spend one last Christmas with us, to celebrate my birthday with me one more time... and ultimately, I wanted her to live long enough to celebrate her 50th anniversary with my dad. I miss her every day. This week has been particularly hard for some reason. I've been battling sadness and melancholy as I've drawn closer to this day---a milestone she was never destined to reach, despite my prayers and desires. My mom would often joke, "Who gets married on Groundhog Day?" She was right. I suppose there are worse holidays to share your wedding anniversary with, but not many. I can still picture her laughing about it with a wicked twinkle in her eye. My mom lived easily in the world--able to find contentment, joy and fulfillment in the things that mattered most: family, friends and faith. She would find a way to be at peace even when everything around her was spinning out of control. I learned from my mom that perhaps the greatest strength that any of us could possess is the strength to surrender the outcomes of our lives to God. My mom held loosely to the rules, regulations, doctrine and dogma that so many Christians seem to cherish. If she held on to anything tightly it was her unwavering trust that God was present in her life and was in control. And so she was able to relax and float. Her ability to surrender brought her peace and joy, and enabled her to not take things too seriously--including the day she was married. "Who gets married on Groundhog Day?" My parents, that's who... fifty years ago today.